After Dinner Mints Recipe makes delightful and delicious mints made from scratch like Grandma used to make. Substitute butter for one ingredient in same formula and enjoy Old Fashioned Butter Mints Recipe, too. Recipe below. 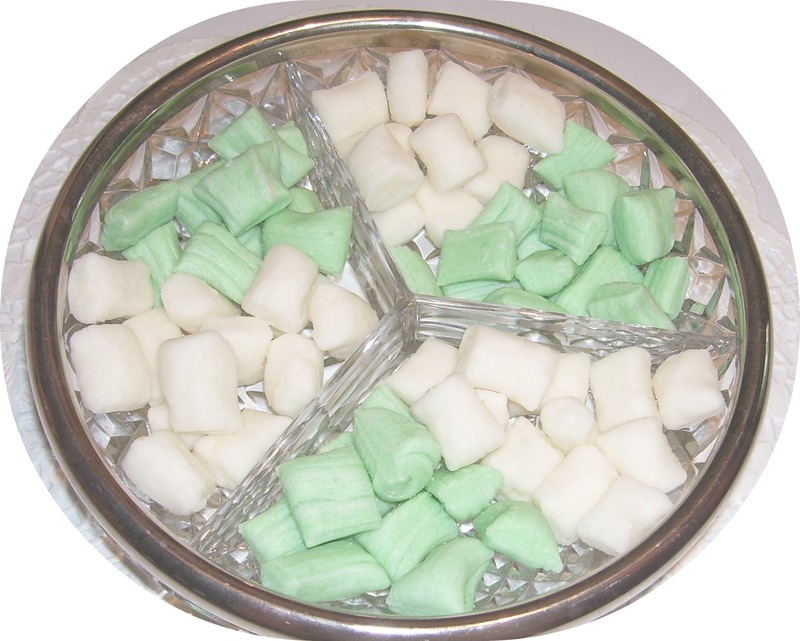 Making After Dinner Mints is a dessert the whole family will enjoy making together as well as eating. Place sugar, water and corn syrup in a 2 quart saucepan and set on medium heat. Stir until it comes to a boil. Place the lid on pot and time boiling for 3 minutes. (This is to wash down any sugar crystals that are clinging to sides of pan). Remove the lid. If there are any sugar crystals left on sides of pan, lightly dip a pasty brush in water and wash them down into the candy. This prevents your batch of candy from crystallizing. Place your candy thermometer on the side of the pan so the bulb is down into to liquid but not touching the bottom or sides of pan. Let the candy cook without stirring until it reaches 260F. Remove pot from heat and let set 3 or 4 minutes to cool. Gently stir in peppermint extract. Pour onto a buttered cooked sheet (preferably one without sides which will help the candy cool more evenly) or a buttered marble slab (the best choice because it cools the candy more evenly and much quicker). When the edges of the batch start to cool, lift them up and fold them over into the middle of the batch. This will help the candy cool evenly, especially if it has been poured onto a cookie sheet. When the whole batch has cooled enough to handle, turn it over so the bottom side will cool slightly too. When all the candy is cool enough to pick up, grease (butter is best) your hands and start to pull it with both hands to make a rope about 2-3 foot long. Fold the rope in half and keep pulling into a rope and folding until it becomes light colored but still pliable. It will begin to get hard to pull because of heat loss. Lay the finished rope down on a surface such at your cookie sheet, or marble slap you cooled it on, which has been sprinkled with powered sugar. You may have to cut it into 2 or 3 ropes, depending on the length of your pan or slab. (I use my countertop at this stage, unless I have added food colorant. I can shape and roll the whole rope getting the diameter the same size from end to end). Hopefully. With a pair of greased, sharp scissors, working quickly, cut the rope into 1 1/2" lengths (or the size you prefer), separating them so they don't touch each other. Sift powdered sugar over them to cover and leave mints out for about 8 hours or overnight to harden on the outside. They will get creamy on the inside. After the outside has hardened, shake the powdered sugar off or sift them gently to remove it. *Peppermint Oil can be used instead of the pure peppermint extract. I especially like it better in the After Dinner Mints Recipe because of the recipe's full focus on peppermint/menthol flavor. It has a stronger menthol content. However, it is not as readily available as the extract and a lot more expensive. You may find the oil in specialty food stores, health food stores, etc. and online. If using peppermint oil use only 15-18 drops for each recipe. ** It is wise to test your thermometer before beginning your candy making. To test it for accuracy, place it in the pot you are going to use making sure the bulb in in the water and not touching the sides of the pan. Bring it to a full rolling boil. If it is accurate it will read 212F. If the boiling point is off a degree or two, adjust your candy finished temperature accordingly, up or down. Follow the cooking instructions as in the After Dinner Mints Recipe above. If you chose to color your mints add the colorant, drop the colorant on the batch just before you start to pull the candy. It will mix the color in as you pull. You might want to wear food handling gloves to keep the colorant off your fingers. Also, if you choose to use peppermint oil instead of the extract, drop those oil drops on the batch when you are fold it over, just before you pull the candy. When pulling your candy mint rope if you want a smooth looking mint fold the rope over without twisting as I did the white mint in the above image. If you want your mint to have the rope traditional look as I did in the green mint in the image, twist the rope each time you you pull it. This will give each piece of candy a little different look (twist). Both versions are especially wonderful for serving after dinner. Serve them as a between-meal snack. Serve them at wedding receptions, anniversary parties and baby showers. Package them in cellophane bags and tie pretty bows on the bag for a great gift. If you enjoyed this recipe you may enjoy my uncooked Peppermint Patties recipe.